We are a trusted Manufacturer, Exporter and Supplier of Bulletproof Vest (BPV-K9) from China. We are backed by a team of dexterous professionals who design them in accordance with the international quality norms. With us, feel free to place even bulk orders of K-9 One Vest bulletproof vest for dog as we have the ability to deliver them well in time. A K9 officer face the same if not greater risk than human officer as they are often sent in ahead of their human counterparts to apprehend suspects or investigate dangerous situations. 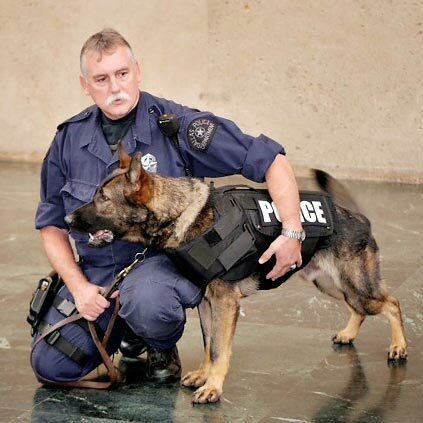 Meet our featured K9 protector in need of a vest. How much does a K9 vest cost? The cost of a vest can vary due to differences in quality, material, protection level, weight, etc. Be careful as lower prices may sometimes mean fewer layers of ballistic protection. Click here for K-9 One? Vest pricing. How do the K9 vests compare to human officers' vests? The K-9 One? vest is made with Dupont Kevlar, which is the same material that human officers wear. This vest also undergoes the same testing criteria. Manufacturer's warranty for the K9-One? vest is 5 years for the ballistic material and 3 years for the cover. The K9-One vest is adjustable and also comes in various sizes.